Yonsei Univ. Yonsei Univ. Yonsei Univ. Yonsei Univ. SNU Korea Univ. Korea Univ. Ranked 1st in the 2006 National Private Universities Assessment for Educational Investment by Korea Foundation for the Promotion of Private School (KFPP). 1,468.1% of educational restitution rate. Educational Reform Top Universities in 7 consecutive years, 1996-2002 by Ministry of Education & Human Resources Development. 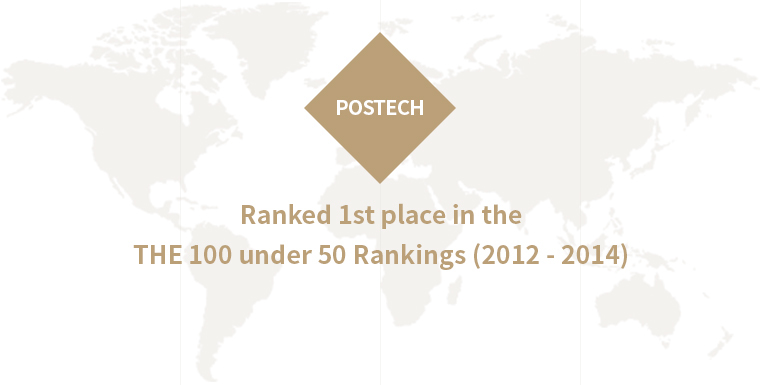 POSTECH was selected, for the first time among domestic universities by Ministry of Education & Human Resources Development, in 7 consecutive years from 1996 to 2002 in the educational reform top university support project to offer financial assistance to the universities with excellent performance and operation program for education reform. Ranked 1st among Asian Science and Technology Universities by “Asia Week” in 1998, the Hong Kong Weekly Magazine.